A Super Bowl prop bet classic, guessing the length of the national anthem always sets the tone for the rest of one’s gambling day. After the backlash Knight received for agreeing to perform, I imagine her relishing every second and turning in one of the longer renditions in Super Bowl history. This is a clear over. A simple look back at history provides the answer to this question. 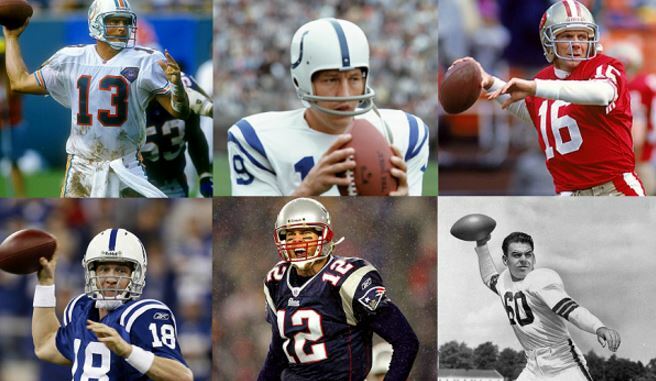 In the eight Super Bowls Tom Brady has been a part of, it has been heads three times and tails five times. More specifically, it has gone heads, tails, tails, tails, heads, tails, tails, heads. Notice the blatantly obvious pattern? It’s never heads two times in a row! And since patterns NEVER break, bet all your money on tails (don’t actually, because each coin toss is an independent event in which the result of one coin toss has no impact on the probability of the next one, therefore indicating that everything I said leading to selecting “tails” holds ZERO validity). Apparently Bill Hader was in last year’s Pringles Super Bowl commercial, and as a huge Bill Hader fan, it must not have been very good since I don’t remember it. The same can’t be said for Doritos, which crushes it every year with its Super Bowl iteration. With The Backstreet Boys and Chance the Rapper both rumored to be in this year’s commercial, it feels like a safe bet to say Doritos will be the first snack food featured during the game. Now that we’re down to the four beer (logical) options, the simplest strategy is to consider which beer first comes to mind when you think of football. Over the past few years, no beer has placed more emphasis on becoming synonymous with the NFL than Bud Light. Between the unlocked fridges following the Cleveland Browns’ first win this season and the customized NFL Bud Light cans, expect to see a “Dilly Dilly!” commercial immediately after the first punt or score of the game. For all of Sean McVay’s brilliance, timeout management is not one of his strengths. Re-watch any Rams game from the past two years, and I can promise you the team will have burned at least one timeout before the first quarter ends. Add in the adrenaline/nerves the Rams will surely be feeling and some bizarre schemes from New England’s defense, and you can all but guarantee a timeout during the Rams’ first offensive possession. 6. Who will score the first touchdown of the game? In eight Super Bowls, do you know how many times the Patriots have scored a touchdown in the first quarter? I’ll give you a hint… I have scored just as many as them. The Patriots are 0-for-8 in the first quarter with Brady under center, and since I expect this to be a high scoring game, I’m counting on the Rams to get in the end zone first. New England’s corners have shut down opposing wide receivers in the red zone during the postseason, which leaves me with the Rams’ running backs and tight ends. Since Gurley’s health remains a mystery and defensive tackle running back C.J. Anderson doesn’t offer much beyond three-yard runs, I’ll take Gerald Everett, the athletic pass-catching tight end who just so happens to have been born in Atlanta. Sticking with the theme from the previous bet, I think the Rams put six on the board first, courtesy of a Goff-to-Everett touchdown pass. The Rams and Patriots each got to this game playing smart, disciplined football. While nerves may certainly play a factor, I think both teams will be sharp in their execution. At +750, it’s worth taking a shot on no turnovers being committed by two highly efficient offenses. Sean McVay, Jared Goff, Todd Gurley and Aaron Donald may steal all the headlines, but Johnny Hekker also deserves some recognition for the Rams’ success. Beyond his expert fake punt skills, Hekker also happens to be one of the best in the league at actually kicking the ball. New England will be wary of a fake punt, and therefore won’t send nine guys to block the kick, giving Hekker all the time he needs to boom a 55-yarder. Well, this one would be a lot easier if Cody Parkey and the Bears were the NFC Champion (too soon, Chicago? ), but goofy special teams moments always seem to take place on the NFL’s biggest stage. 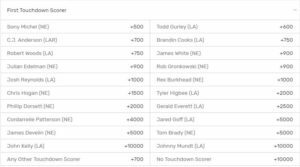 While Greg Zuerlein and Stephen Gostkowski have proven to be about as automatic as NFL kickers come, it’s worth 20 bucks to root for every kick that takes place in this game to doink off the upright. Kicking props are fun! While everyone’s groaning about how Brady or Goff missed an easy third down throw, we get the last laugh as we anxiously cheer on Zuerlein and Gostkowski. Fun fact: The last kicker to make a field goal over 47.5 yards in the Super Bowl was John Kasay of the Carolina Panthers in Super Bowl XXXVIII against the New England Patriots. For those not doing the math at home, that’s 14 straight Super Bowls where the under was the winning side. I’m banking on these two teams making it 15. This might be the weakest pass catching corps Tom Brady has ever carried to the Super Bowl, which is really saying something. Rob Gronkowski has clearly lost a step, Chris Hogan doesn’t strike fear in opposing defenses and Phillip Dorsett wouldn’t crack the starting lineup on 25 of 32 NFL teams. That leaves Brady with Edelman and James White as his two most reliable options. As the slot receiver, Edelman will be matched up with the Rams’ Nickell Robey-Coleman, who has created plenty of controversy leading up to this game. This will be a matchup New England tries to exploit, resulting in 10 catches and 95 yards for Edelman. Brandin Cooks will likely be matched up with New England’s top cornerback in Stephon Gilmore for much of the game, which should open up plenty of opportunities for Robert Woods. The speedster has posted 6+ catches in five of his last six games, and is Goff’s favorite target out of play-action. Facing off against a suspect Patriots linebacking corps, Woods should find plenty of space in the middle of the field to eclipse this total. Tom Brady has competed in eight Super Bowls. He has completed 26+ passes in six of his eight appearances. Add in a Rams defensive line that has stifled rushing attacks led by Ezekiel Elliott and Alvin Kamara in its last two games, and Brady is a lock to complete at least 30 passes in this one. New England has yet to allow a sack this postseason and the Rams have only tallied a total of three in their first two games, which explains why this total is so low. However, Rams defensive coordinator Wade Phillips is well aware of the importance of getting pressure on Brady, so I expect him to dial up plenty of blitzes. With Aaron Donald consistently occupying double teams — opening up opportunities for guys like Dante Fowler and Ndamukong Suh — the Rams will sack Brady at least twice. Alright, this one is free money. We saw Romo’s brilliance on full display during the AFC Championship Game, and that involved a total of five correct predictions. Despite the hot streak, I don’t imagine Romo increasing his number of predictions in this game. He’s going to be so excited talking about Brady’s legacy, Sean McVay’s hair, Belichick’s sweatshirt and Aaron Donald’s explosive first step that he will give a maximum of six pre-play predictions in this one. Really, Bovada? Purple Gatorade? There’s a better chance the players dump Chick-fil-A Barbeque sauce on Sean McVay or Bill Belichick than Grape Gatorade — and remember, this game is taking place on a Sunday. Unless these teams secretly hate their respective head coaches, there’s no way they are cruel enough to drench McVay or Belichick in the only flavor that tastes like Robitussin. When the Patriots defeated the Falcons two years ago to cap off the biggest comeback in Super Bowl history, there was too much pandemonium for the Patriots to drench Belichick. However, two years before that at Super Bowl XLIX, the Patriots doused Belichick in blue Gatorade, indicating it’s a flavor the team enjoys. When you also factor in that it’s the Rams’ primary color and by far the tastiest flavor, all signs point to blue being the clear choice. After this game opened as a pick, it’s surprising to see the line move three points in New England’s favor. While the Patriots’ victory in Kansas City was impressive, the Rams are also coming off a strong victory in an equally hostile environment. The Patriots boast the better quarterback and head coach, but the Rams possess more talent on both sides of the ball. In what I expect to be a high-scoring, back and forth affair, I think this one — just like the last time these two teams squared off in the Super Bowl — comes down to a field goal as time expires. However, unlike Super Bowl XXXVI — when Adam Vinatieri made a 48-yard field goal to give the Pats a 20-17 win — it’ll be Greg Zuerlein drilling a 45-yard field goal to earn the Rams their second Lombardi Trophy in franchise history. 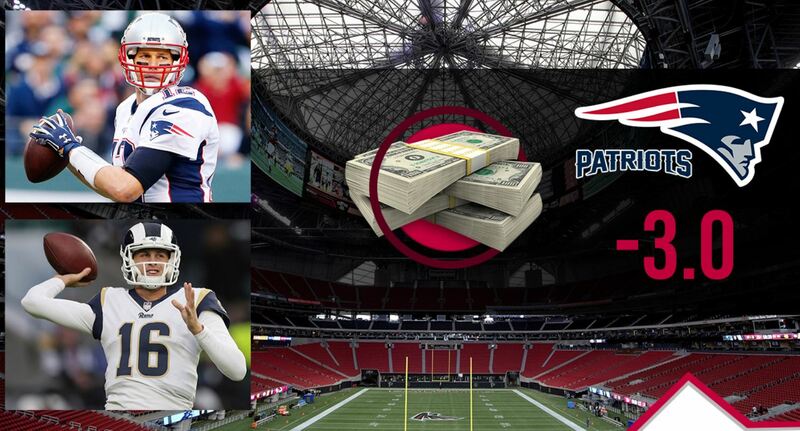 20. Who will win Super Bowl MVP honors? Piggy-backing off my score prediction, I can obviously eliminate any Patriots. As an aside though, there is no point whatsoever of picking any Patriot not named Tom Brady. In Super Bowl LI, James White had 139 yards and 3 touchdowns (including the game winner), and the MVP was… Tom Brady. In Super Bowl XLIX, Malcolm Butler made the most heroic interception in Super Bowl history, and the MVP was… Tom Brady. 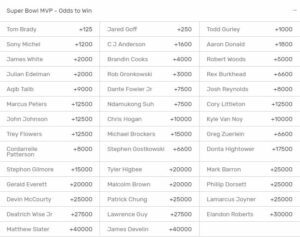 If you like the Patriots in this game, take Brady (+125) or no one. Since I think the Rams will win this game though, it comes down to Jared Goff and Todd Gurley for me. Although Gurley’s health has remained a bizarre storyline, if ever there was a time for the Rams to unleash him, it would be this game. The Patriots had no answer for Kansas City’s Damien Williams in the AFC Championship Game, and Gurley is a much bigger offensive threat. Although I expect Goff to play well, I think Gurley will have 100 yards from scrimmage and two touchdowns, which will be enough for the former Georgia Bulldog to collect MVP honors.